I was banging on yesterday about how much more enjoyable unfined/unfiltered reds can be. This isn’t as cloudy as the Woodlands, but again shows the ‘naturalness’ of a light touch. More wines with minimal additions/subtraction in this vein please. Andy Coppard, Lino Ramble winemaker, has had a big few months, leaving his full-time winemaking gig at Kay Brothers, moving house and then kicking everything up a gear for a big 2015. With wines like this in the stable his probably making a good choice. Produced from Don Oliver’s (Oliver’s Taranga) vineyard at Seaview, this was made fermented naturally, basket pressed and bottled unfined. 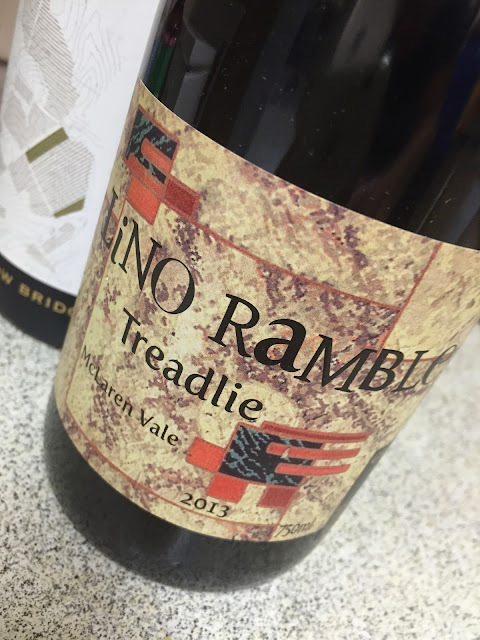 It’s a breezy, utterly Grenache dominated wine (though it makes up just 57% of the blend), with slick, raspberry juiciness, a whisp of softly caramel oak, and then sandy Grenache tannins on a gentle, slightly smoky warm-hearted palate. Unforced and even, this just feels right. It’s perhaps a little light and slick (I’d like a fraction more mongrel), but unquestionable attractive.